If you fall into the category of the people who have a hard time remembering where they kept the important papers, bills, taxes or information; then worry not these online tools will let you create fake receipts directly within your browser. All you need to do is just go to their websites and fill in your relevant details in the already generated receipt format. Simple and trouble free? It is one of the best online receipt maker sites. You just have to provide the product details or name to generate a new receipt. The various types available are ATM, restaurant, taxi, retail shop, gas receipt, movie rental, etc. You can save your document, download, print or clear it as per your requirement. It also provides you with the service of generating an invoice by providing company name, address, date and time. Overall it is an excellent online site to create receipt and invoices. Developed by Tom Backwell, It is a nice and efficient online gas receipt maker tool. Simply, navigate to the site and then in the first blank space “Top line 1” fill the company name and in the next two following blanks fill the addressed lane. The rest of the blanks are for entering the details regarding the item whose custom receipt you want to Make. After filling the last two blanks and specifying whether you want to calculate the total amount or not, you can click on “Make the receipt” to generate your required document. The only disadvantage is that it calculates only in the dollar so you can add prices in your currency and choose not to show the total. This free web-based app can efficiently create a customized online receipt. This is an advanced option that is used for sales refer generation. It has a large number of choices and fields. To add an item line you can click on “Add line” button. Similarly, to remove an item line, you can click on “Remove line” option. It is well defined as sales receipt, fake receipt, and custom receipt maker. The three sections that are available at the beginning are ‘Seller information‘ where you have to fill the necessary information of the vendor, ‘Purchases‘ where you need to enter details like items along with their details and taxes, and finally the ‘Make Receipts‘ sections in which you can select either dollar, Euro or GBP. Next, you just need to save your receipt to the computer. This is an online receipt creating site that lets you create a receipt for almost any purpose. Each receipt costs a small amount but once you become a member then by paying a nominal one-time fee you can avail the service for free. 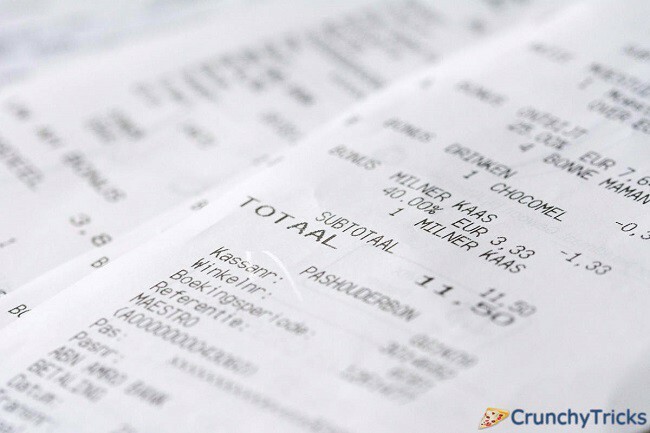 The various categories of receipts available are a standard receipt, gas receipt, itemized receipt, taxi receipt, single receipt, parking receipt, a restaurant receipt, etc. At first, you need to fill out receipt details and then select the option “Make receipt.” Upon selecting this option, your customs receipt will appear on your device screen. Then if you are okay with the preview, you can go to “Buy receipt” or else you can make the necessary adjustments. The payment can be made by credit cards as well as PayPal. You can finally “download” your fake receipt and save it to your device. If any of those are a mandatory field, then the site will show you error message before submitting along with suggestions for what to fill in that space. Also, a custom preview will be shown first before actually making the real and final receipt. It is a great online fake receipt maker site. When you navigate through the site, you will notice that there is already honk space for filling various required fields. At first, you need to fill the company name, followed by a business address, state, city, postal zip, and country. You can also change the date of the invoice. Then at last while adding money, there is a separate space where you need to fill the tax and then the total amount of payable money. Then click on “Save Invoice.” You can also print your invoice or create a PDF of your receipt. It is one of the most commonly used and favorite online receipt generator tool. Once you go through the website, you can find details like company name, address, email, phone no, item descriptions, units, total money, etc. to be filled. There is a separate column where you need to write down the taxes. It also provides the option of editing your template. Also, the table can be resized by adding or deleting rows. This site needs no sign-up. Thus you can create your desired invoice straight from the landing page. All you need to do is fill the details in the template according to the space provided and then click on “Download Invoice” to download a PDF of your invoice. Also, there is an option “Edit this invoice” which lets you make required changes to your invoice. You can also send your invoices to various other clients directly from the web page itself by clicking on “Send invoice.” All the generated invoices get auto-saved to your device which can later be accessed by the help of “My Invoices” option. This is one of the best tool of 2016 for creating fake invoices and bills. It has pre-designed templates in which you just have to fill your details. It has over 100 different templates to fit your need. You can also download and send your PDF invoice. The necessary details to be filled include your company name and address, billing address, invoice date, the logo of the business, amount, subtotal, etc. It is one of the most easiest online receipt maker tool. There are two sections – “Received By” and “Paid By.” Just fill the necessary details in both the fields by providing name, address, city, state, postal or zip, email, phone no, etc. Then you need to select which currency type you want in the receipt, and it will automatically calculate the payment due. Next step is to choose the preferred payment mode and then click on “Continue” mode. By doing this, a preview of your receipt will be shown to you, and then you can send it to your customer. That’s it! These are the lists of the sites that can create fake gas receipts and invoices. So now even of you forget your gas receipt, fuel receipt or hotel bill, etc. you can lay back, relax and take help from these sites. READ : Outsourcing Options: Which Works Best For You?